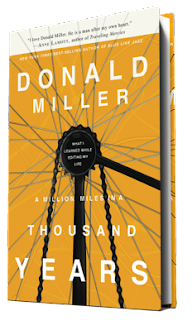 Last Friday evening I picked up Donald Miller's A Million Miles in a Thousand Years. When I put it down on Sunday afternoon, I was finished. The title is intriguing, sure, but for me it the book was so much more than what the title implied. Which is weird, since the title includes the words "million" and "thousand." But whatever. I decided to go the "something else" route. I quit my job to replace work with dance parties and playing at the park and writing things. I also decided to hike a 70+ mile ancient wall on another continent with people I've never met, an event taking place six months after quitting my job. And just last week, I almost went grocery shopping at 9 p.m. THE WORLD IS MY OYSTER. This book reminded me that taking risks (ones like quitting a job or traveling, I'm not talking about starting my own drug cartel or anything) will yield a better story (although there are a lot of Hollywood types who think drug cartels make good stories). There are bloggers out there who have inspired me to live a better story—ladies like Sarah Von of Yes and Yes, and Not That Kind of Girl—but this is the first book I've come across that captures the spirit of living an adventurous, meaningful life without sounding preachy. Read it. For real. I received this book for free from BookSneeze.com. My opinion of a book is based solely on the book's impressiveness or suckiness, and is in no way affected by its freeness. My opinion can't be bought...for anything less than six figures, at least. since i decided to start reading more this year (and even finished my first book last month)...i'll give it a go. i need some motivation (and a game plan) to quit my day job and pursue art full time, even though the thought of it scares the hell out me. oh and booksneeze.com - seriously?? FREE books?? that is the most awesome thing EVER. Okay, I'll look it up. Also: I believe you may be underestimating drug cartels. Enjoy the wall! And if you deter from the wall, watch out for sheep droppings...believe me. Some of the weirdest sheep I've ever seen were there, but I don't think I've seen enough sheep to give a proper opinion on that subject. I'll just stick to books! Looks like a worthy read. I am still pouting about the Bisons regular season sweep of my school. At least we still have the tournament to extract revenge. The world is totally your oyster! Enjoy it! And, if you ever decide to walk the A.T. let me know, I could use a walking buddy. (That's always been a big dream for me.) Now to hunt down this book, certainly sounds awesome! Six figures? The world is your oyster! I'd take five. Looks like a good book. Do we ever know what we want to be when we grow up? A little inspiration and direction can't hurt. I love the idea that I am the author of my story! Thanks for putting it out there. I just finished the book a few weeks ago. I second your recommendation, not that you needed my second. And ditto on what Kate said. It's hard not to have a good story where drug cartels are involved. But I think human trafficking is the new drug cartel. I'm going to check that out, sounds like it would definitely be worth my time. Wow, I guess I missed the part where you quit your job! The world is your oyster indeed :) That walk sounds fabulous - wish I could join you. tell Booksneeze that I promptly ordered the book on the strength of your recommendation, as did a few others, I think. I'm about a third of the way through and still waiting for the bike part of the story to kick in -- I know it's coming, from the cover art.